Based on French surrealistic film "Un Chien Andalou", by Spanish director Luis Bunuel (1928). 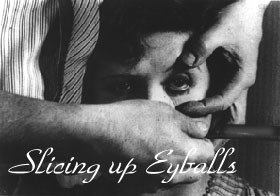 The film has a scene in which an eyeball is being cut open. "I am un chien andalusia" actually mixes English ("I am"), Spanish ("un", which exists in French, but is actually pronounced as in Spanish), French ("chien"), and something undetermined ("andalusia" as such is neither French nor Spanish). Debase [De*base"], v. t. [imp. & p. p. Debased; p. pr. & vb. n. Debasing.] [Pref. de- + base. See Base, a., and cf. Abase.] To reduce from a higher to a lower state or grade of worth, dignity, purity, station, etc. ; to degrade; to lower; to deteriorate; to abase; as, to debase the character by crime; to debase the mind by frivolity; to debase style by vulgar words. Debaser [De*bas"er], n. One who, or that which, debases.